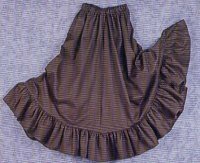 Full skirt with elastic waist band and ruffled hem. Available in Black or Red. Our standard size fits up to size 12.